In the winter of 1962, Eric and his younger brother, Joel, help a runaway teenager by hiding her in a den in their snow-filled back garden. The diminutive Grace, swamped by an over-large coat and huge, almond-shaped brown eyes, captivates the two boys. But she is vulnerable, and her arrival will change everything-not just the coming of Christmas, but Eric’s entire life. I feel full and warm in my heart after a long time...something I associate with a beautiful book. These words seem too cold to describe the warmth and secret gladness tinged with tears I feel for Grace. And yep, that's how you're going to feel too...it's too lovely for words...that bubbly feeling inside of wanting everybody to feel like you! My first kiss. My first love. She was a little match girl who could see the future in the flame of a candle. She was a runaway who taught me more about life than anyone has before or since. And when she was gone my innocence left with her. Found in a dumpster trying to grab something to eat. Behind the McBurger Queen. Where Eric finds her. Learns about her running away from home. Offers their den (with the indoor tap and a pin-up girl in a red swimsuit) as a temporary place to live, (“I have a girl hidden in the den.”Joel shook his head, “You wish”).Unknowingly giving Grace a place in his heart as well, (“You’re my hero.”“ Anytime”, I said. Of course I wasn't about to win any award but when you’re a fourteen year-old boy with acne and a bad haircut, it felt good to be somebody’s hero. )Trying to escape his mother’s notice (How do you explain having a girl with you in the bathroom??! ).Playing hooky from school. Placating his father, who is paralysed due to Guillain-Barre syndrome (but will recover).Learning how a good friend is someone you can lean on. And love (Is a birthday gift worth 27 dollars worth the kiss you get in return? ?Sure is! ).And trust. And make sacrifices and take risks for. And even betray (Why DID Grace leave home?). And forgive. Grace is like hot chocolate (and I'm hungry! )...it warms, delights, surprises, cheers and reassures. Especially when it's cold! A four-point-fiver I'll whole-heartedly recommend! Go go get it...my family doesn't know how lucky they are to have the book in the house! All of this sounds beautiful. The book, the review, and especially you, Talitha. You just made this big grin appear on my face...I'm a praise junkie! 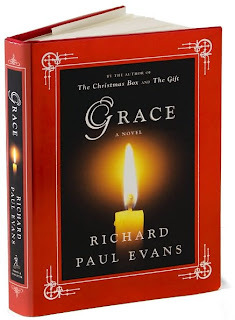 totally Grace-ful read and review !